"This is a low fat, tasty alternative to regular ice cream, and it tastes wonderful!" In a medium bowl, whisk together the yogurt, soy milk, honey and canola oil. Pour into an ice cream maker, and freeze according to the manufacturer's instructions. 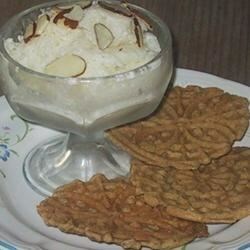 Scoop ice cream into serving bowls, and garnish with chopped almonds. I've been making ice cream and frozen yogurt for a while, and this is by far the worst tasting recipe I have tried. It is extremely sour. Find another recipe! Very good but I made some changes. I used Fage greek yogurt(2% and 0%), AGAVE nectar as sweenter, frozen unsweetned strawberries, and almond milk. It was great! Thanks!